If I rewind back to one of the most thrilling trekking experience that I had before Tarsar Marsar, it would be from my Kedarkrantha summit. Feet were hurting, the temperature was in negative but the heart still felt warm. 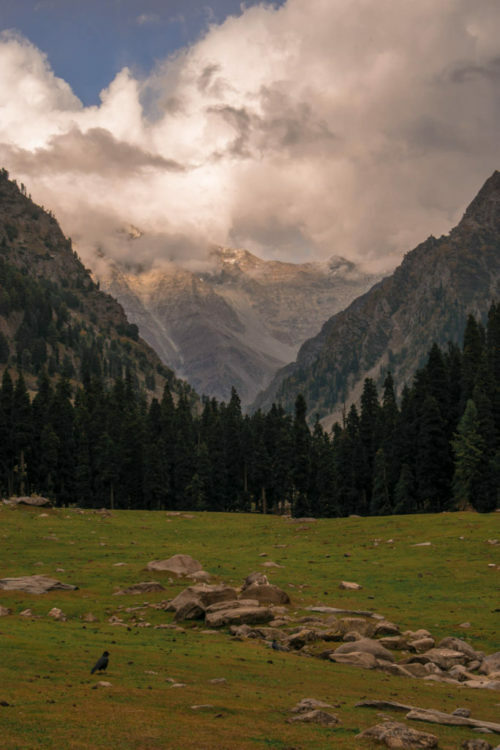 This was the same feeling in Tarsar Marsar Trek as well – a trek that I gifted myself on my 25th birthday and trust me, it could not have gotten any better. Living in the pastel colours of blue, green and white was a fulfilment of my childhood dreams and landscape drawings. I saw some of the most beautiful lakes that I never thought existed, I saw sunset and sunrise while drinking away kahwah, I experienced snowfall in October, saw the clouds dancing around the sun and made a lifetime of friends with down to earth amazing humans. I saw an emerald lake and another one that changes colour with the changing sky, I pushed myself with every step and if you know me, you will know how much I crave for challenges. Below, I would like to help you as well in the planning for this trek and how you can go about it. 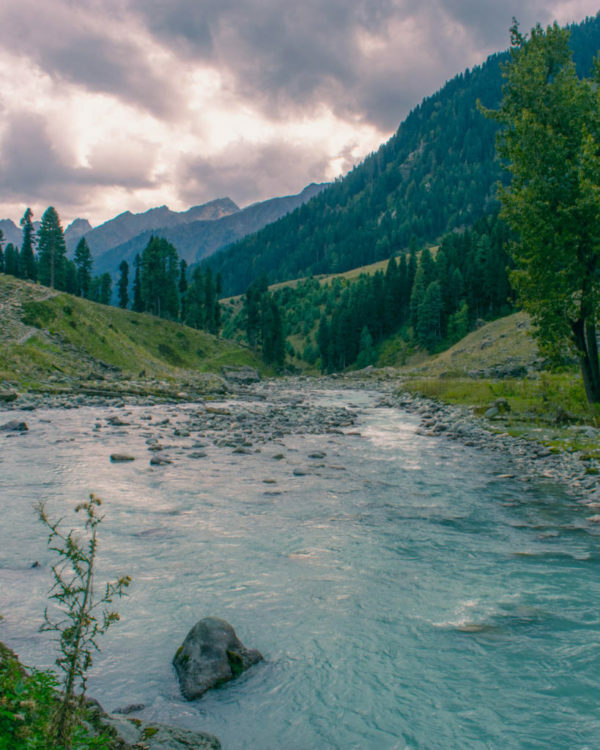 Tarsar and Marsar are two lakes that are in the Pahalgam region of Kashmir. To reach here you have to cross meadows, forest areas and several river streams. Tarsar Lake – The Lake is situated at an altitude of 12, 450 (3,795 metres) and the colour of the lake changes with the changing colour of the sky (quite literally!) I have actually seen the lake’s grey, brown, green and blue colours in just one single day! To reach here, it will take a minimum of two days at least. Marsar Lake – A little ahead of the Tarsar Lake, is another gorgeous lake called Marsar, which also has a lot of dark stories around it (ask your guide when you reach the lake). People hardly camp near Marsar Lake and witness the gorgeous bird’s eye view of the lake from a height. One can get a partial view of the lake after hiking for an hour from the Tarsar Lake itself (like we did). Or, you can trek to Sundarsar Lake and hike for another hour to see the bird’s eye view of the entire lake (which we missed). Below is the map we followed that showcases the distance between each camping point. You can tap on the icons to get the details of the camping site. The trek is indeed difficult! Not because it has steep ascends and many boulders, but I had my backpack while trekking and on a single day we all walked for 22 km straight. This was because while descending we skipped one camp and trekked down all the way to our base camp. On the pathway, we faced hailstorm, rain and snowfall, and while all this seemed adventurous but it took a toll on the mind and body. We all had cramps and muscle aches which showed how much we lacked when it comes to fitness. I remember that once the ache in my shoulder was so severe that I felt like giving up – this was on the day when we walked 22 km. But thanks to Vignesh (Hola Vignesh! ), that he took my bag and walked off before I could protest. Although the other trekking websites rate it is a moderate trek, I would still suggest you be ready for all kinds of weather and challenges. Some of the days are fairly easy where you will walk only for 5 km but if you camp at Sundarsar Lake, while descending from this camp you would have to cover a distance of 18 km to come down to the camp 1 – be prepared for this day! You can trek anytime from April to September end. June and July are considered the best months as you can see greenery all around with clear weather. I went here during the end of September to witness beautiful snowfall. In fact, our trek guide told us that during the winter season foreigners come here especially to do skiing. But to get the best of the views, I would recommend you to go during the summer season itself. There are several routes that you can opt. 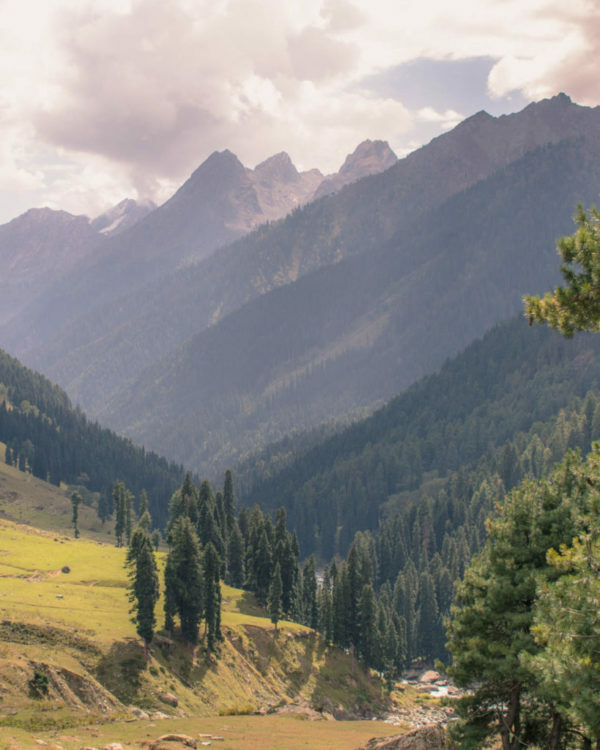 I personally chose to fly till Srinagar (you can read about it here) where I spend two days on a houseboat and then moved to Pahalgam’s Aru Valley. Aru Valley is the place where the trek starts. Below I am providing all the alternate routes you can take to reach Aru Valley. Book a flight till Srinagar. If you will book a little in advance, the flight ticket could cost you less. And if you have a fixed plan, book a round trip which will give you a further cut in the price. The flight duration is about an hour. From Srinagar, you can take a shared taxi that leaves directly for Aru Valley and costs about INR 2,500/- per vehicle. If you are going with a trekking community to Tarsar and Marsar Lake, most likely they will arrange a shared taxi for you from Srinagar. If you are travelling alone and you are on a budget (like I was), you can take a shared taxi from TRC in Srinagar. From here, you can reach Anantnag first. From Anantnag, there are regular shared taxis leaving for Pahalgam. Aru Valley is closer to Pahalgam and you can easily hitchhike to Aru. But again, this is only an alternative if you are not travelling with any trekking community. To reach Aru Valley will take around 4-5 hours if you take a direct shared taxi from Srinagar to Aru. We crossed some beautiful landscapes and apple lanes. We also crossed Pahalgam which was really breathtaking. The Lidder River has a lighter shade of blue colour which is really soothing to see. Aru Valley is at the outskirt of Pahalgam and starting here you would not get any network. We were glad that we were finally out of the network zone because the calm was very welcoming. All of us were soaking the view around us and me, well, I was busy recording time lapses of the dancing clouds. Accommodation – We stayed at Friend’s Guest House and the hospitality of the people was amazing. It had everything, from hot water to home cooked food. We snuggled inside the comfort of our warm blankets as the temperature falls while coming from Srinagar. The next day after having breakfast, we left for Lidderwat. The trail was right next to our guest house. The hike at the beginning was a little difficult as the pathway is really steep, however, after about 45 minutes we entered a forest area of pines where the walk became smooth. We came out the forest area after a while to witness the beautiful meadows. Only the initial hike was a little difficult and after that the walk is smooth. In between, we also sat down in between to have our lunch when it suddenly started to rain. This is when we realised the importance of our ponchos/raincoat! We also crossed a bridge and were greeted by many locals on our way. After a trek of about 6 hours, we reached the campsite by 2 PM. The next day we got up to witness a glorious sunrise and a chilly weather. Honestly, the early mornings are so difficult always during the treks since you have to get outside your sleeping bags and then your camp to be welcomed by fresh mist and extreme cold. Brushing the teeth in ice-cold water and refreshing yourself is a whole new different story. All you could do is hope for the sun to touch your bare skin soon enough. But this time is also when you get the most glorious views of all time. We took our cup of tea to sit on the edge of the valley and saw the blue calm river of Lidder and the snow peaked mountains at a distance. Ravens were flying beside us and enjoying the freshness as much as we were. After this, we again started to trek to our other camp called Shekwas. The trek is not difficult today except for the part when you have to cross the boulders. There are so many boulders and all you could do is concentrate and jump from one rock to another. We reached Shekwas at 2 PM and after having lunch we quickly moved to our exploration – Jadar Lake. This is a small lake and not many tourists go here, but I honestly consider myself lucky to witness one of the glorious views of my life. This small emerald coloured lake lies deep hidden amidst the mountains and if you are lucky you will also be able to witness marmots playing around the lake. (Tip: approach the lake silently, else the marmots run away). We could hear the marmots voices from far off and as soon as we reached the place we stood there for a moment truly in awe! Day 4 was a fairly simple trek to Tarsar Lake. The ascent was not a difficult one, however, the weather was challenging. We faced hailstorm and rain on the trail. Upon reaching, we started to pitch our tents and that is when the snow started to fall as well. This was not only a challenging experience for us but thrilling one as well. We danced and fought in snow and also made a snowman. The Lake was all the more gorgeous as it was surrounded with white all around making the lake all the more pretty. It was heaven on Earth literally. The next day, we had to leave for Sundarsar Lake and the trek to this place is really challenging. The ascend is really steep and since it snowed it made the path all the more difficult to climb. So we changed the plans and trekked to another point to see both Marsar Lake and Tarsar Lake together. However, could only get the partial view of the beautiful Marsar Lake. 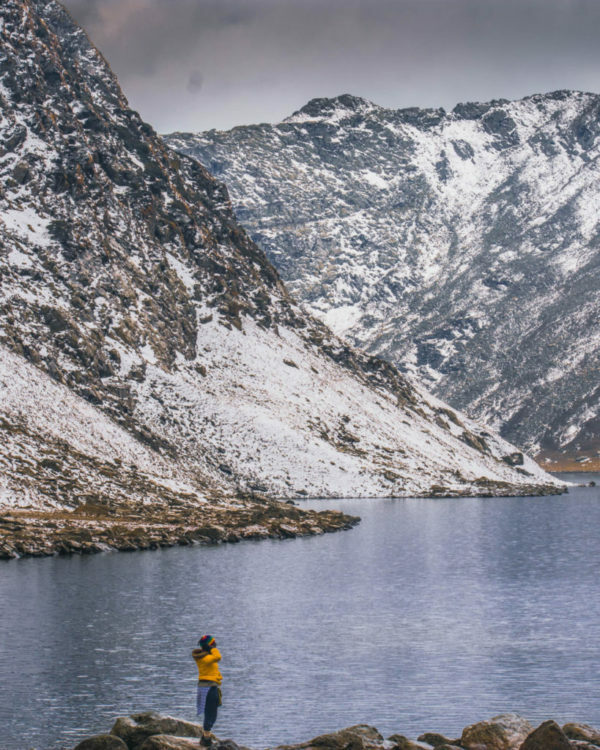 Trekkers usually hike to Sunder Sar Lake and then trek further to see Marsar Lake. In the initially half there is a steep ascend and during snow, it becomes all the more challenging. This is followed by a gradual descent and then a gradual hike to Sundar Sar Lake. After resting in the camp, trekkers usually go to Marsar Lake which takes about 40 minutes to reach. From Marsar Lake you again would have to return to Sundarser Lake. The next day is the most challenging one. We walked 22.5 km straight from Tarsar Lake to Aru Valley. Coming down from such a height and walking the entire day took a toll on our legs. After reaching, all we could think was of a hot shower and a warm bed. However, if covering 22.5 km in a single day is challenging you can also camp in Lidderwat and then hike back down on Day 7. If you are in Sundarsar Lake, then you would have to cover 17 km stretch to camp at Lidderwat. Depending on the choice you made for the camp, you can either return from Lidderwat to Aru Valley first by following the same path that was taken on Day 1 (Aru Valley to Lidderwat). From Aru Valley, we took a shared taxi again to come back to Srinagar. You will reach Srinagar by evening. Do not forget to book the hotel for the night. In Kashmir, you would be needing a postpaid sim or a prepaid Kashmiri sim. In fact, even Jio sims work here but again it should be a postpaid sim or a prepaid sim of Kashmir. The last signal in your mobile can only be received till Pahalgam, so make sure to call your loved ones before that. The last ATM is in Pahalgam itself. Although withdraw your money in Srinagar itself as you will get many ATM options. You can get a number of options for Tarsar Marsar trek and each package varies from one another. 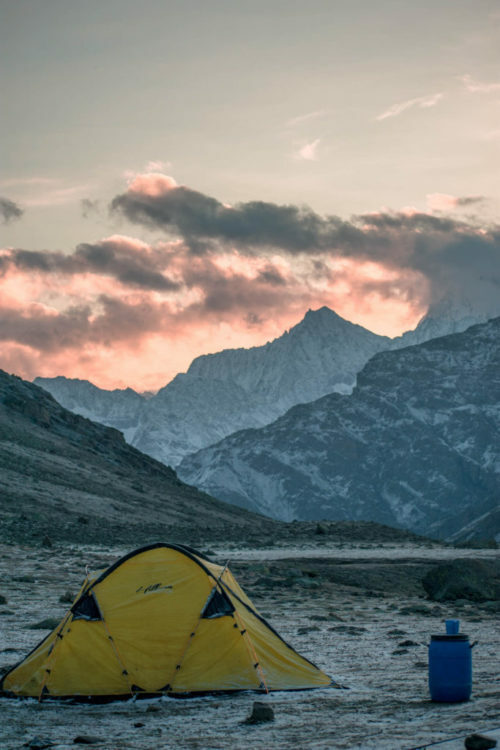 The entire package from Aru Valley and back which includes accommodation in Aru Valley, camps during all the days, three times meals every single day, tea, sleeping bags, etc., cost between INR 12,000 to INR 15,000 depending on which company you book with. You can easily get a room for as cheap as INR 200/- (check www.booking.com), or can stay in Zostel that costs about INR 600/-. Staying in a houseboat will cost around INR 1,5000. It depends on your budget and your preference for the night. 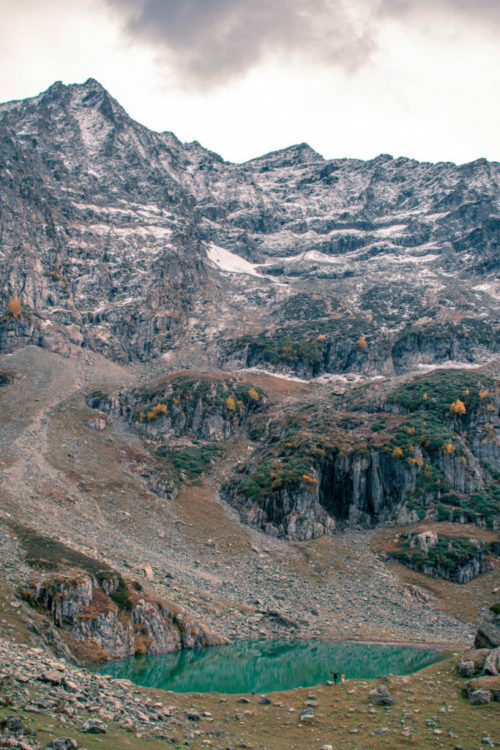 There are many trekking communities online that take travellers on Tarsar Marsar. However, if you want a local experience with a local guide you can contact Vani Bhaiya on 09469461214 (Gowher Ahmad). If you are still speculating whether to go on this trek or not! Do. Not. Think. Just go!!! I have never done a high altitude trek but this trek is something I definitely wish to do. The pictures are brilliant and the guide would be really helpful for a novice like me. Thanks. Apologies Hariom for replying to this comment so late!